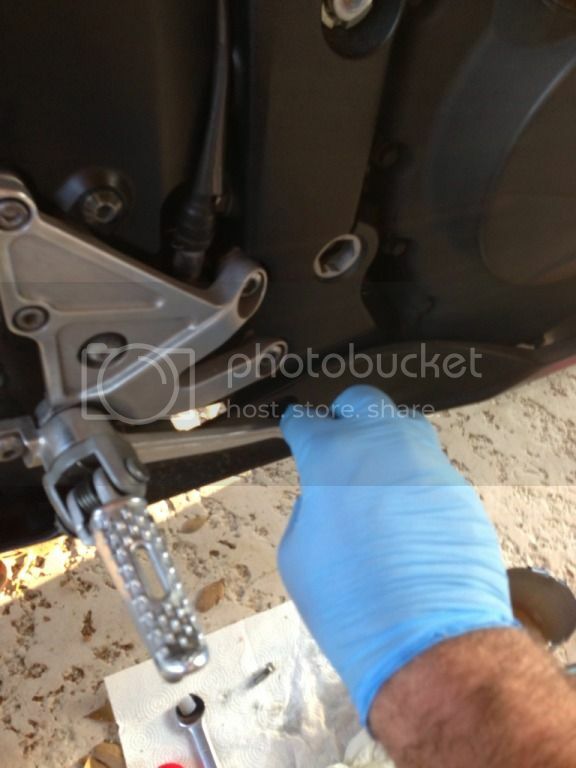 Finally getting around to posting the How-To on changing brake lines on my 06. I will post pics of the 07 as well once I get them installed. The procedure is the same. There are different schools of thought but this is what I did. You can modify the parts list and procedure as needed. 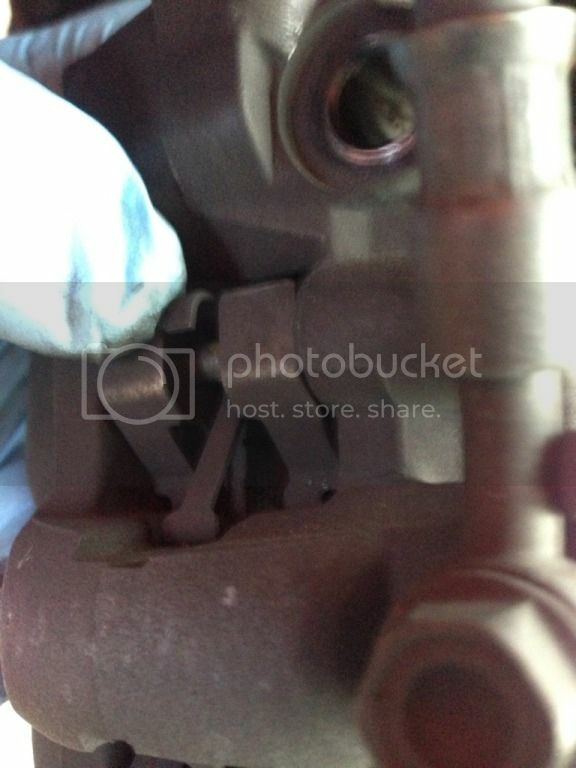 My only warning is that brake fluid is extremely caustic and will ruin plastics in seconds. I got a drip on my speedometer cover and it now has an etch down it. Cover and protect everything and use care. 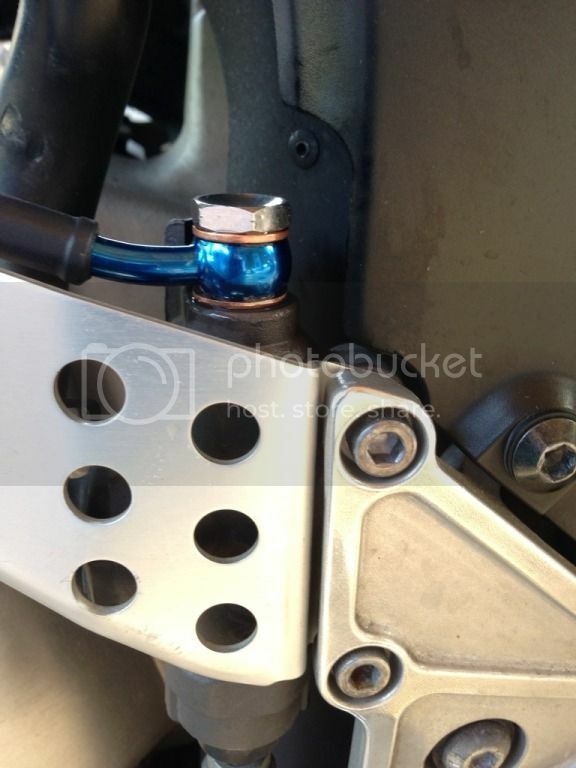 Remove the nut holding the reservoir from the subframe (blue arrow). This makes accessing the two screws on the cover easier. 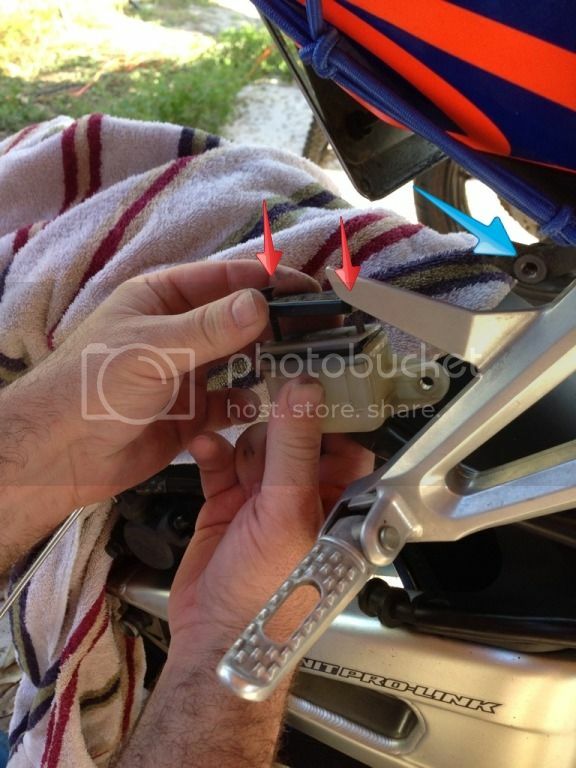 Remove the screws in the reservoir (red arrows). 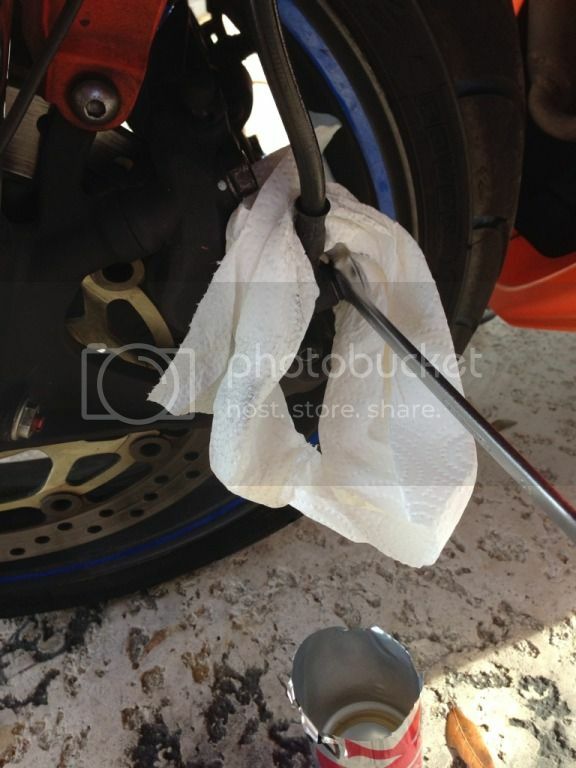 Take care to keep it level, do not spill brake fluid. It is a good idea to cover everything with a towel. 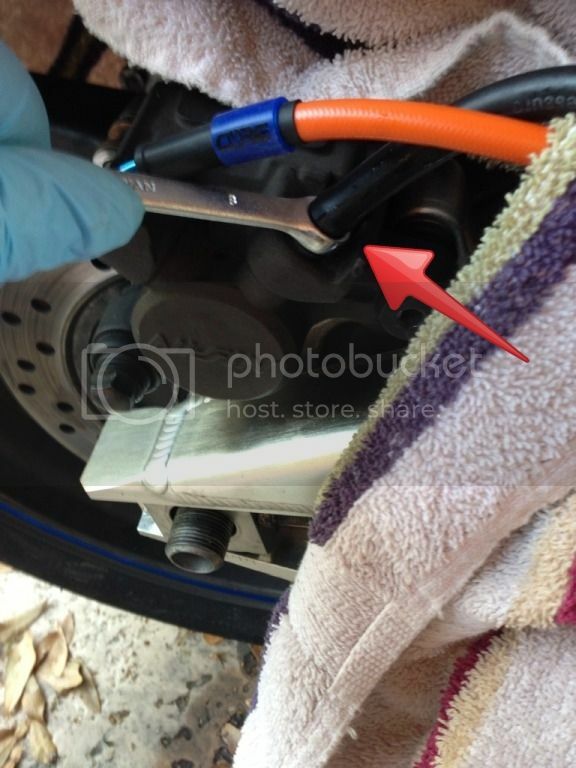 The reservoir has a seal under the cover (blue arrow) and then a rubber stopper (red arrow) that may be extended (just flatten it and dry with paper towel). 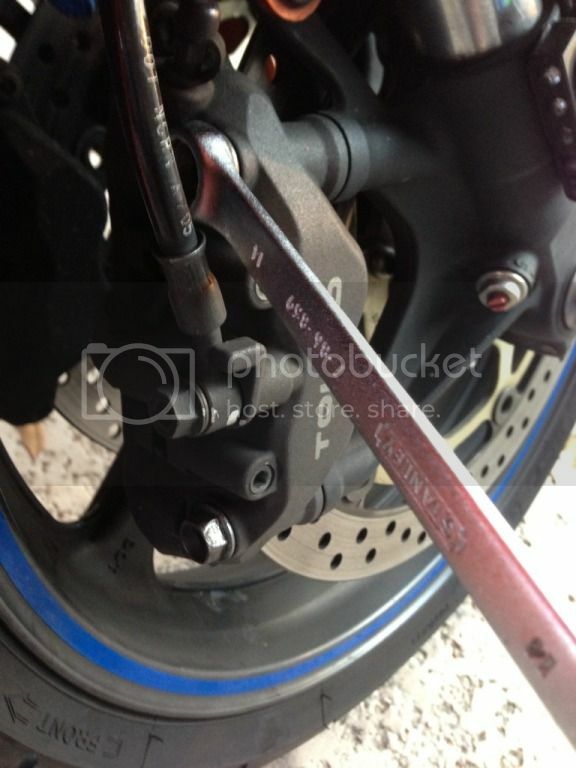 Remove the clamp from the swingarm that holds the line in place. 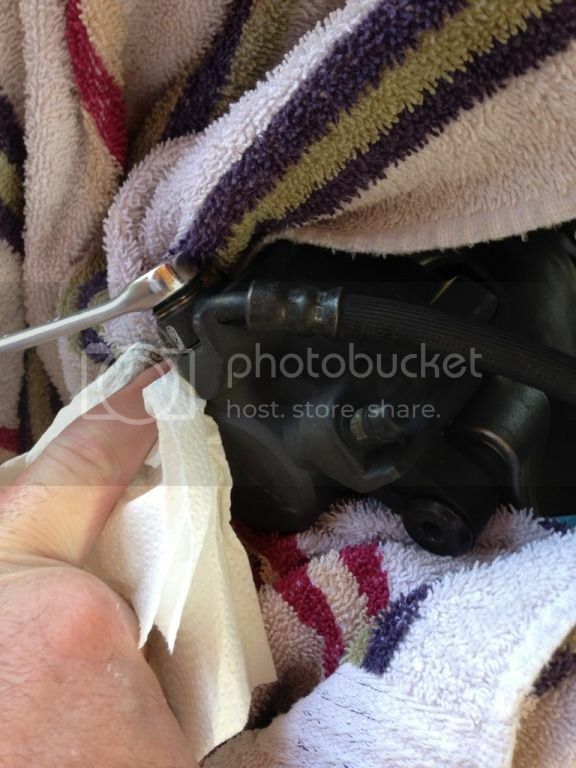 Break loose the bolt from the caliper using a paper towel to catch any fluid and remove it. I used a soda can with the top cut off to catch the fluid in the line. 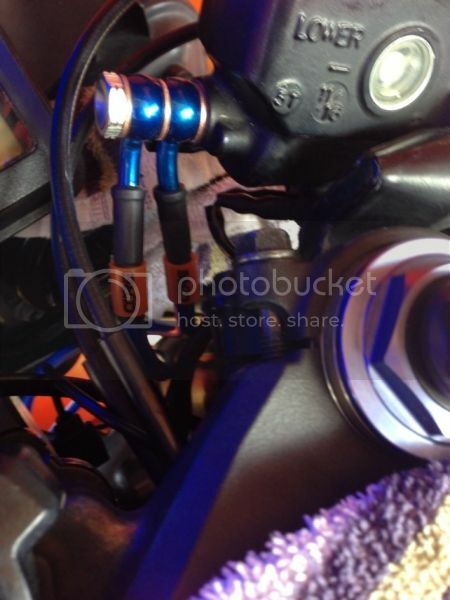 Next break the bolt and remove from the brake master cylinder. Again use a paper towel and don’t drip! 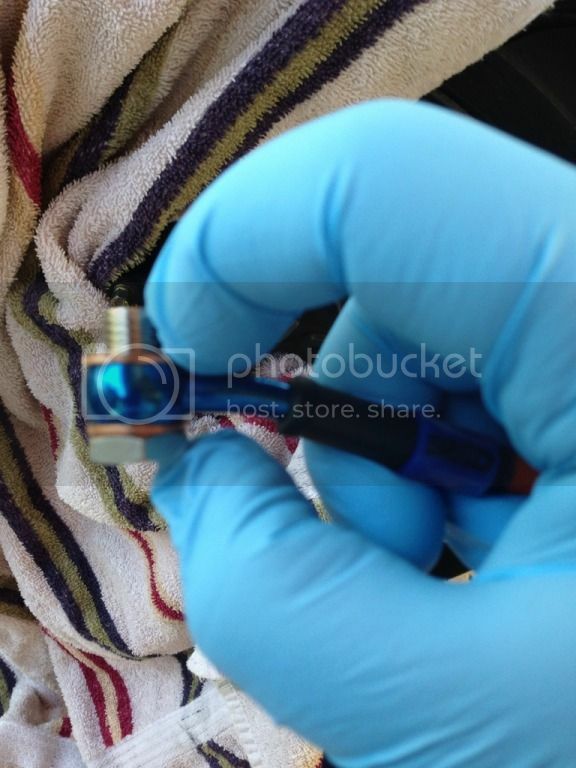 Once the line is removed place the banjo bolt with crush washers in between each contact point. 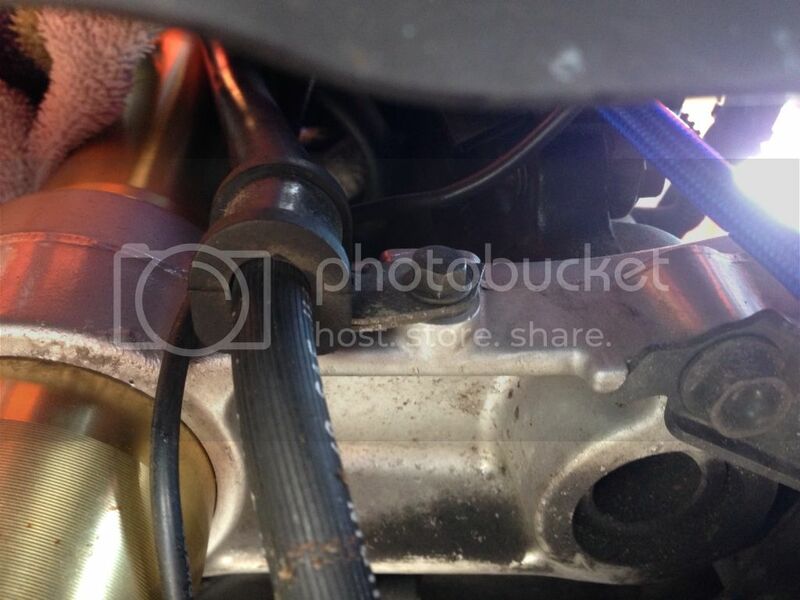 Bolt the line in the master cylinder and torque down. Now you can fill the reservoir and wait for gravity to work the fluid through the line but I chose to bolt the caliper back on. 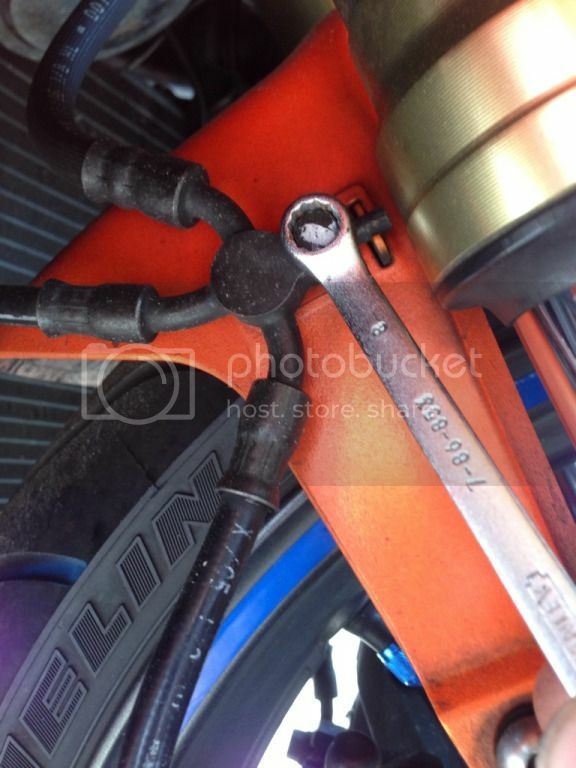 Remember to place crush washers at both contact points on the banjo bolt and torque the bolt. When bleeding the line it is very important to keep the reservoir with fluid in it as not to introduce air into the line or you will have to bleed longer. 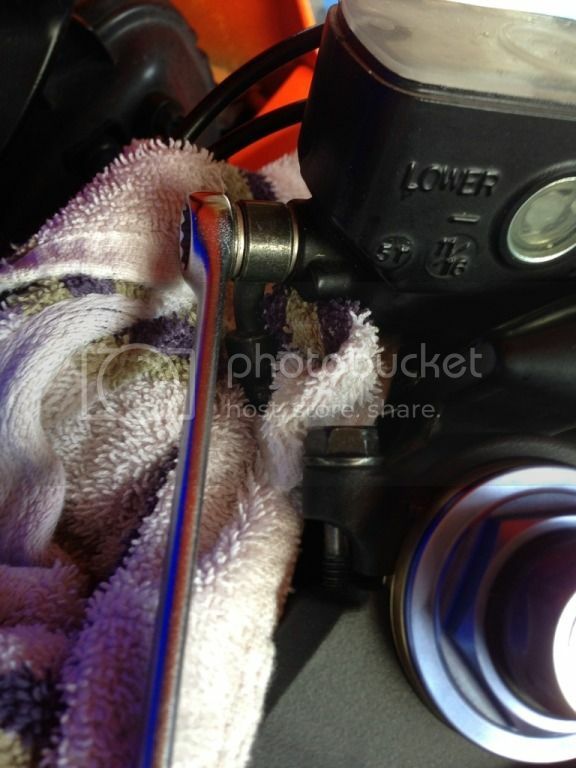 Place the box end of the wrench over the bleeder valve and hook up the vacuum pump rubber line (red arrow). Pump up the brake pedal and hold tight (will not have any pressure for a while). 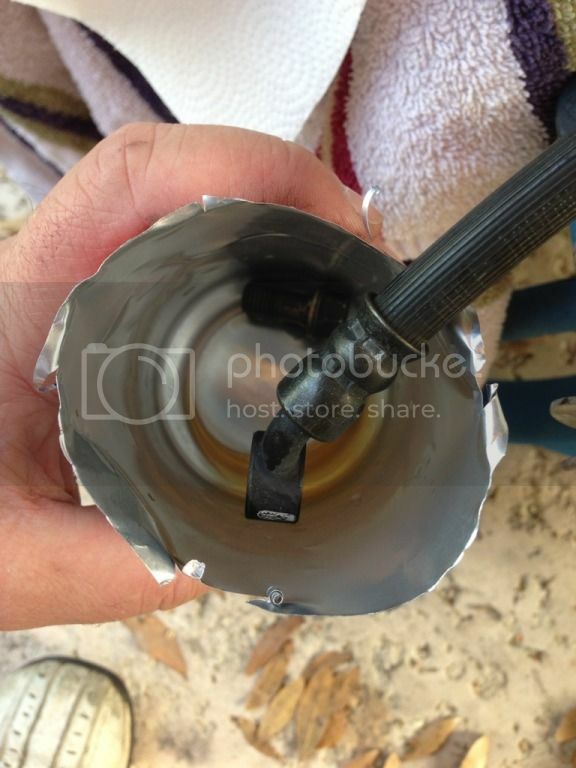 Pump the vacuum and open the bleeder valve carefully. The pedal will push until it stops and immediately close the bleeder valve. Do not let the pressure off of the pedal until the valve is closed. Pump the vacuum again and repeat. Repeat. Repeat. It takes a while. You should start to feel more and more pressure on the pedal and you should watch the reservoir and refill as necessary. It is helpful to have a second set of hands but not entirely necessary. 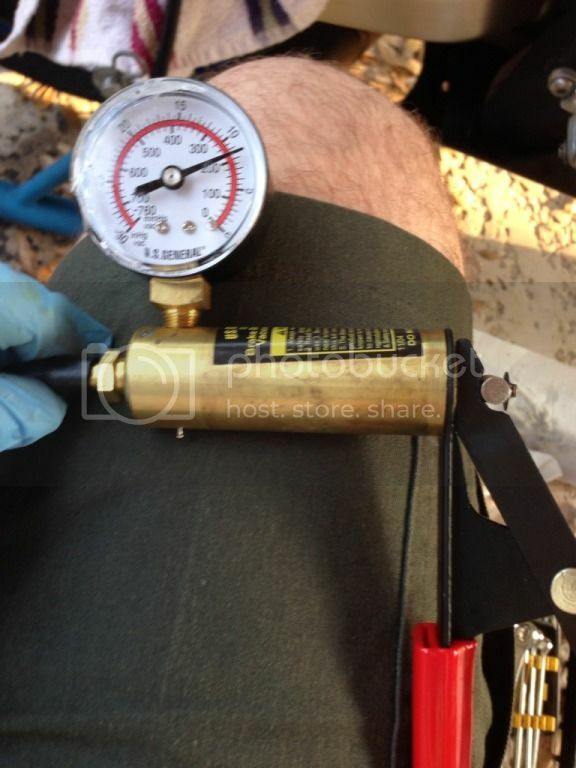 Once you have tight pressure and there is no more air in the line you are done. 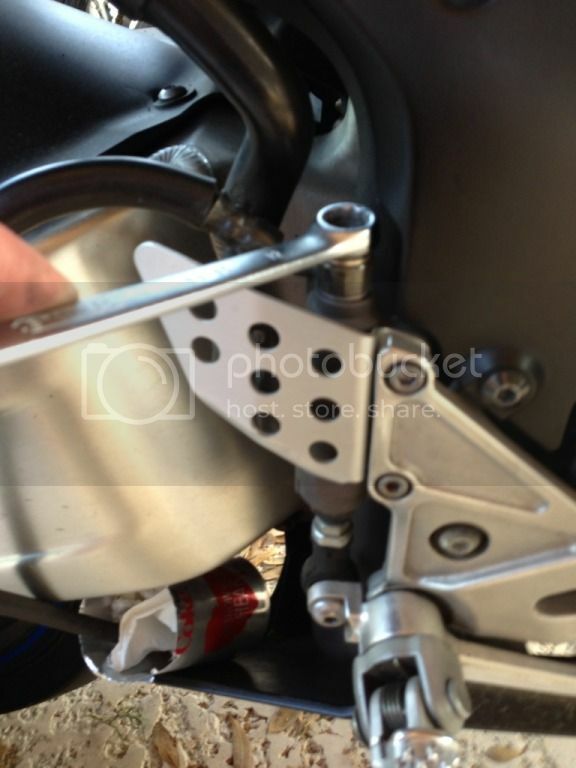 Connect the clamp to the swingarm and admire your work. I needed to change the front pads so it was a good time to replace the lines as well. I removed the calipers and cleaned them before doing the lines. I read somewhere it is best to bleed the calipers in place so they do not get an air bubble trapped in them but that may just be a story. 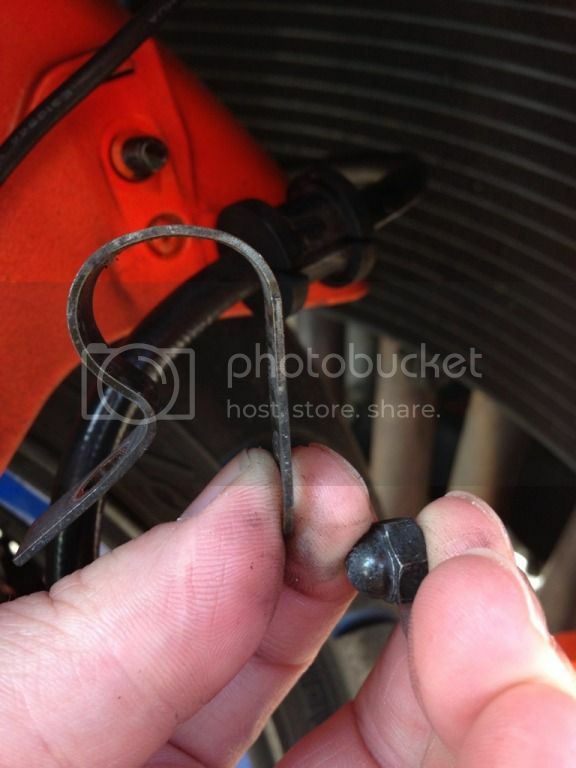 Loosen the pad bolts (allen wrench) then remove the caliper bolts. Once the caliper is removed from the rotor it is easier to remove the pad bolts by putting pressure on the clip while turning the bolts. Once the old pads are out clean everything well. I used a toothbrush and Simple Green. 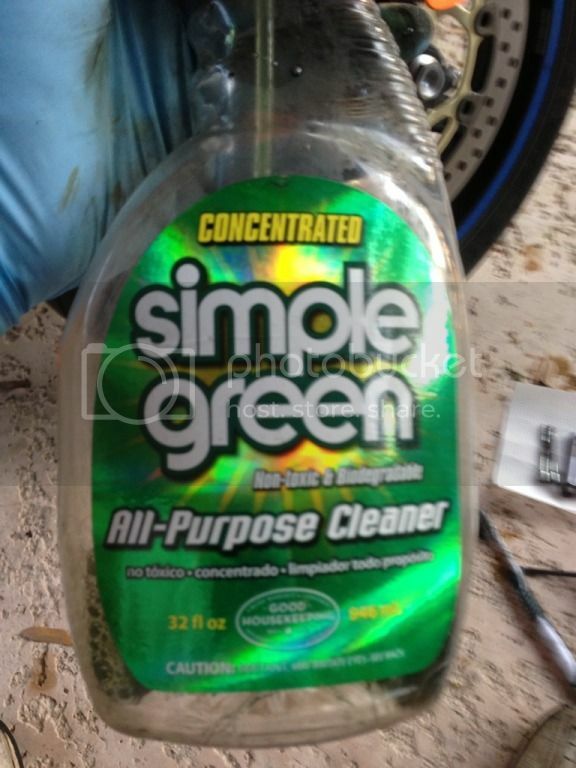 It is a biodegradable degreaser that is safe for plastics, o-rings and everything on your bike. It’s my favorite. Buy it in the big jug and use full strength to mix with water to desired strength. Costs about $5 a gallon. Don’t buy it in the household cleaning aisle, get it in the automotive section. This is a good PM job as well. 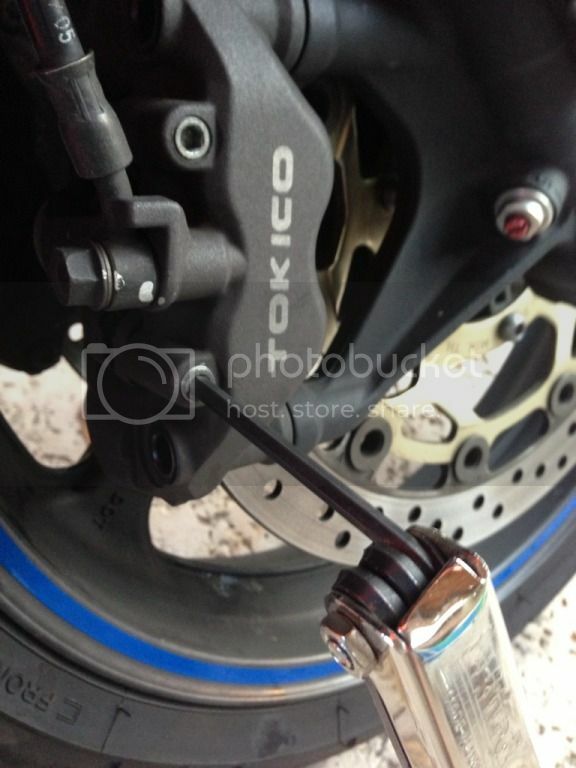 Clean your calipers often in order for them to stay in shape. Once clean, install the new pads. 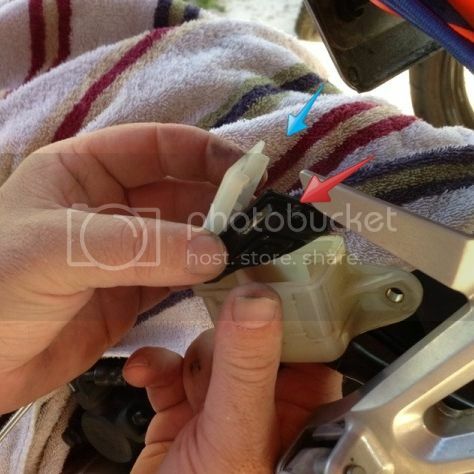 Tighten the pad bolts (remember to put pressure on the clip to help them in place. 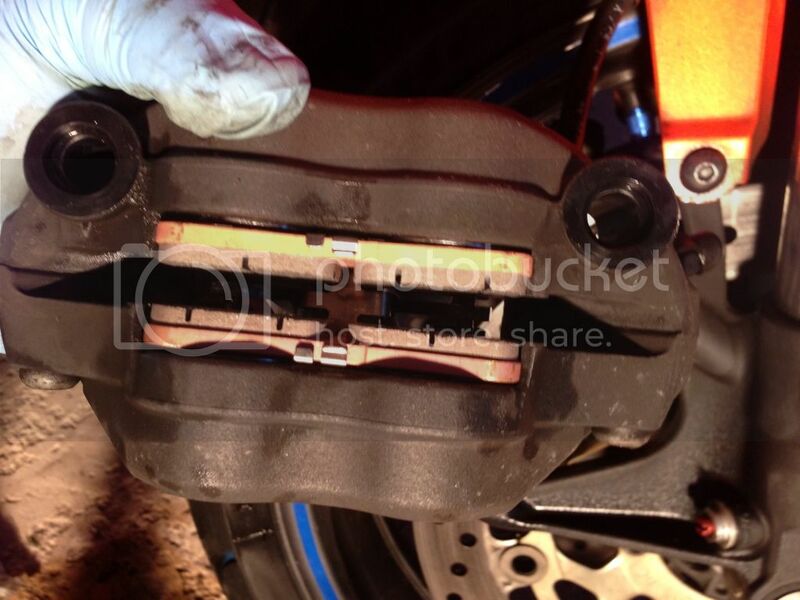 Use a screw driver to carefully pry the pads open and push the caliper pistons all the way out. Re-install the caliper on the rotor. Torque everything properly. 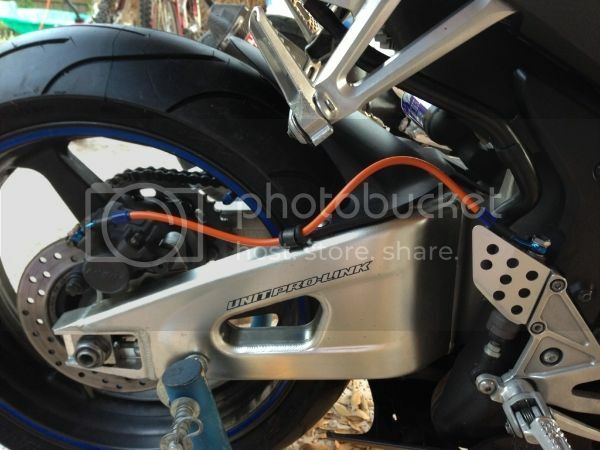 Next remove the clamps on both sides of the front fender. 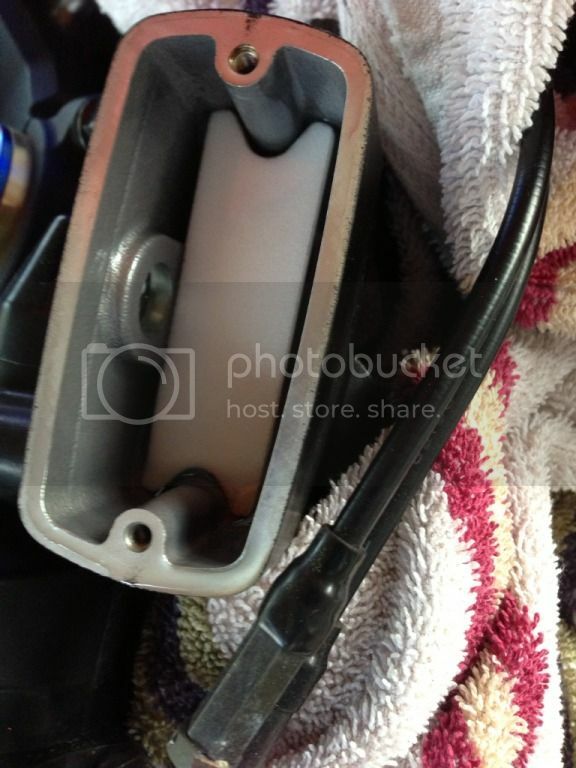 The front reservoir is similar to the rear with the plastic seal and diaphragm. It also has a float in it as well. Make sure you are aware of the order of these pieces when re-installing. 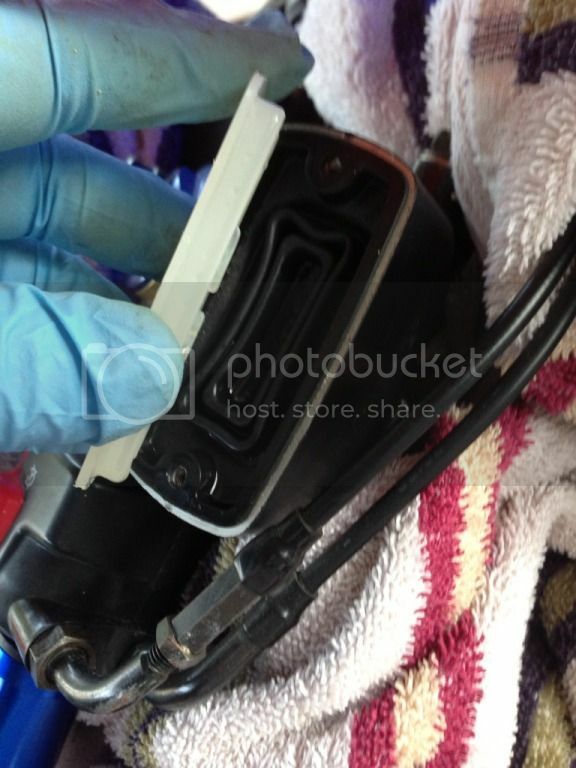 Use the vacuum pump to remove the fluid in the reservoir. 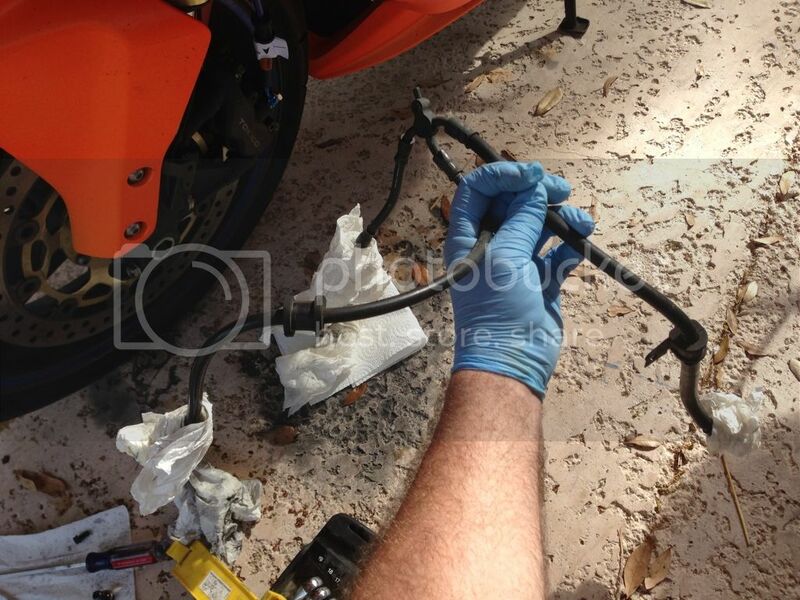 Then break the line at the caliper and drain into the can as before. Don’t drip! Break and remove the line at the reservoir. 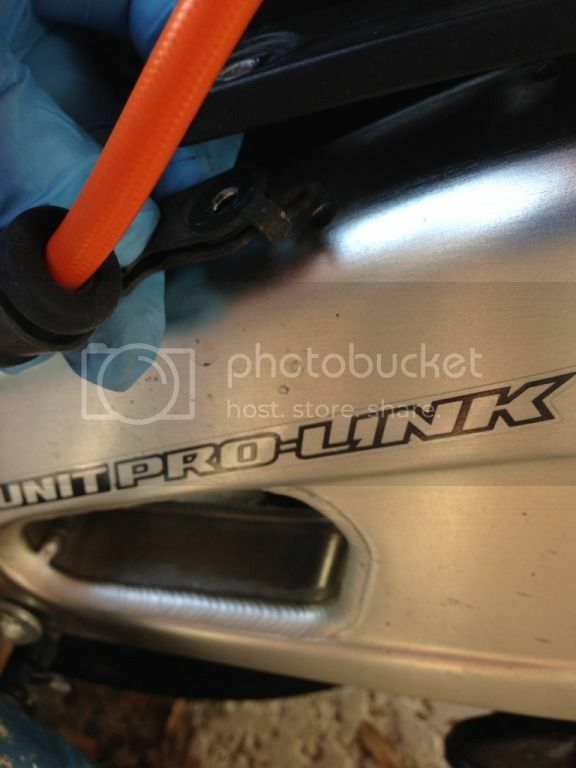 Carefully remove the stock lines. Remember to follow the tags on the Core lines for direction. Both lines hook directly to the reservoir with crush washers between each contact point. 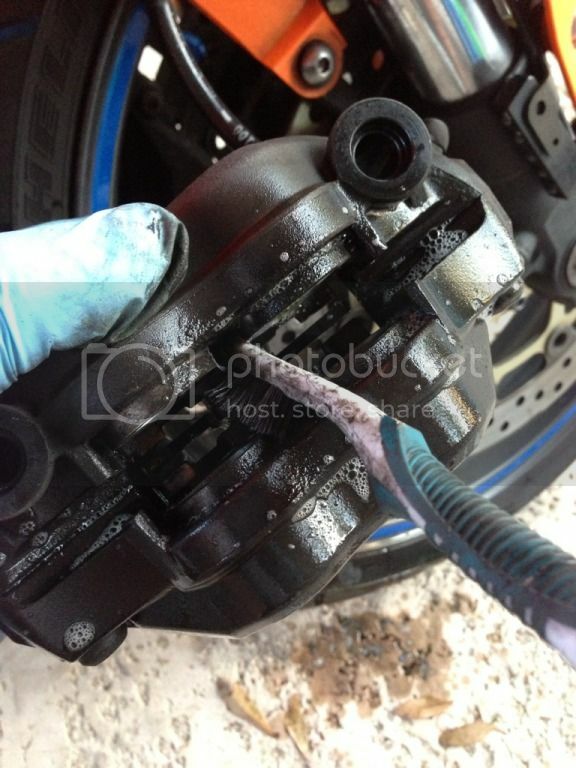 Bolt both calipers back on and remember to torque properly with crush washers at each contact point. Time to bleed the lines. Remember to keep fluid in the reservoir. Start by bleeding the line furthest away first (left side). It will take a while these lines are longer than the rear. I used the clamp on the lower triple tree but not the ones on the fender. These lines are stiff enough to stay where you put them. Although I am told you can order clamps from Core, I have not verified this. –Pay attention to the bends in the banjos as they are curved specifically by bike. 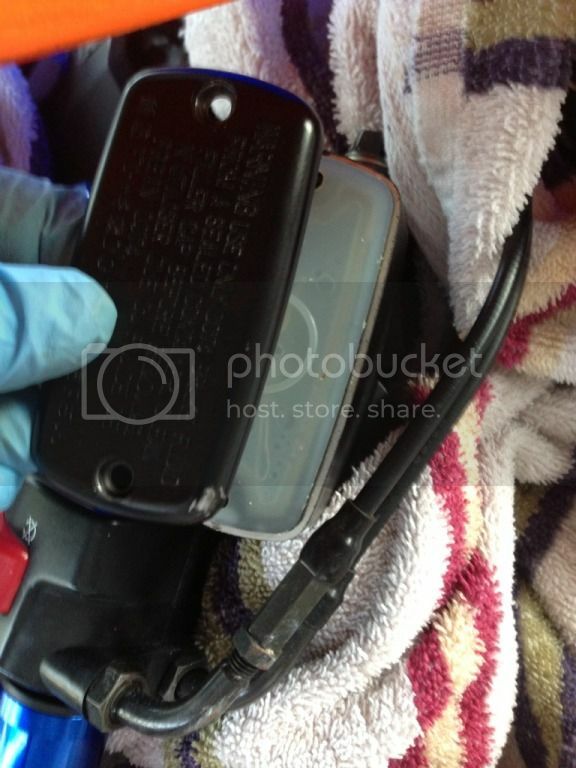 –Use crush washers on each side of every banjo (all contact points). –Keep your reservoir full as you bleed. –Keep fluid off of everything. When you are ready to hit the road don’t go flying off. You need to take it slow and test you pressure and release. Do not hit 50 and touch the brakes. If it locks up you will have a bad day. I hope this helps. If you have any questions be sure to ask! 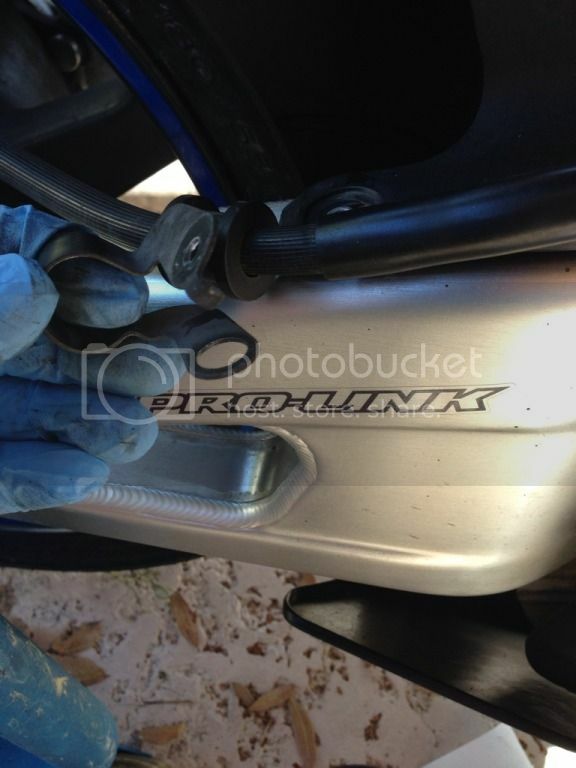 Thank you to @spdygak for submitting a How To Article in our Honda CBR Forum and sharing with the community. Not a RideCBR.com Member? Sign up today. 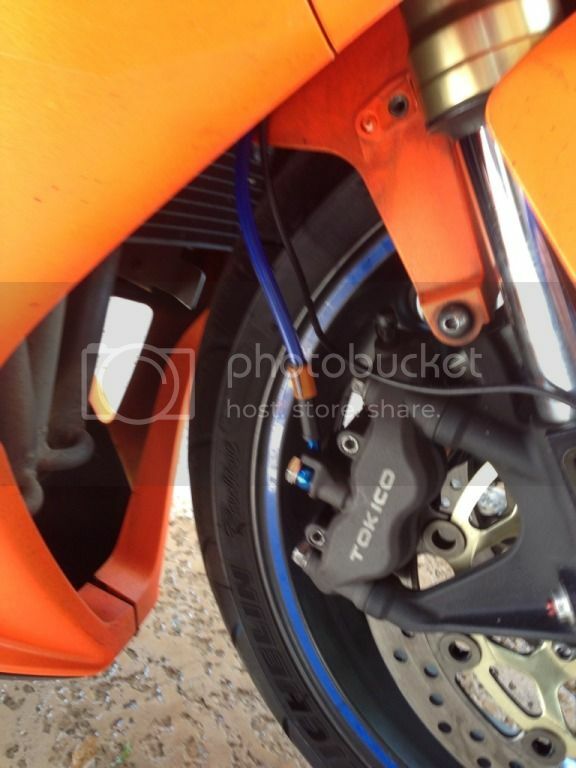 It’s free and you’ll have access to our Honda CBR Forum and Owner’s Community.